Kirkwood Community College Department of Arts and Humanities presents the Kirkwood Concert Band in concert Saturday, December 7, at 7:30 p.m. at the Coralville Center for the Performing Arts. The Concert Band will feature nine pieces by various composers. 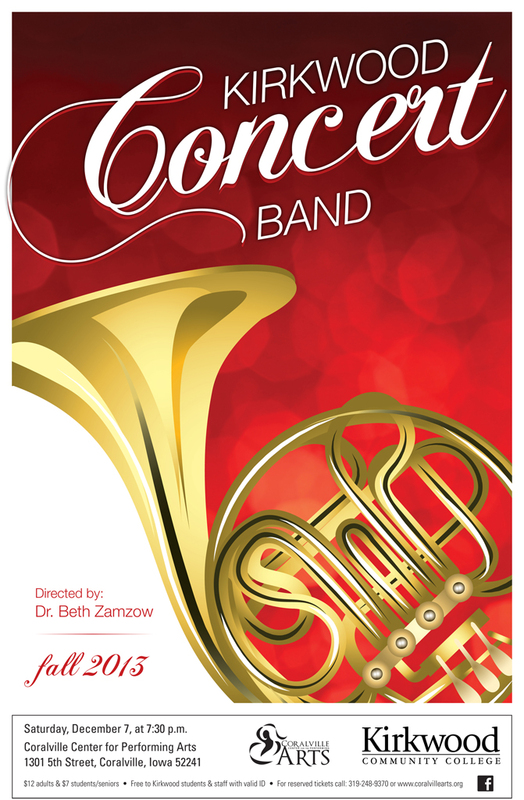 Directed by Dr. Beth Zamzow, the Kirkwood Concert Band is a cooperative effort between Kirkwood students and members of the Cedar Rapids and Iowa City area communities. Tickets are on sale and can be purchased in advance at the Coralville Center for the Performing Arts, online at www.coralvillearts.org or by calling 319-398-5899, ext. 4331. Tickets are $12 for adults, $7 for students and senior citizens, and free to Kirkwood students, faculty and staff with valid ID. Saturday, December 7 at 7:30 p.m.